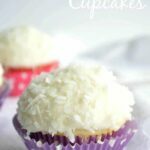 Coconut cupcakes are moist white coconut cake with coconut cream filling and coconut frosting on top. No springtime soiree will be complete without them! Hello there Cupcakes & Kale Chips readers! 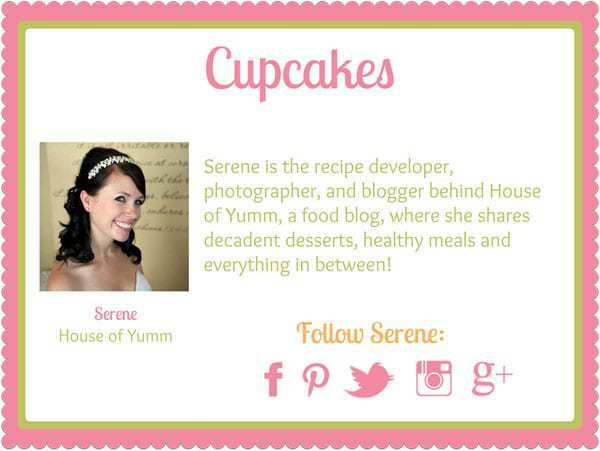 My name is Serene and I blog over at House of Yumm. I am so excited to be here with you all today to share this delicious Coconut Cupcake recipe! Spring and Easter are one of my favorite times of the year, and these Coconut Cupcakes are the perfect flavor for the season! Not to mention, whenever I see coconut like this I automatically think of Easter and bunnies. With all the coconut flavorings going on in these cupcakes they will make your house smell absolutely heavenly! The cake is made with a doctored up cake mix, I used the coconut milk from the can, keep in mind this is different than the coconut milk you would buy to drink and store in your refrigerator. From the can the milk is going to be thick and rich. Perfect for making these cupcakes moist and fluffy! The cake alone is never enough flavoring for me though. I love to fill my cupcakes with a little something special. Filling cupcakes is super easy! If you have an apple corer you can use that, it just cuts a small hole in the top of the cupcake, make sure that you only go down about an inch or so, you don’t want to cut down to the bottom of the cake. If you don’t have an apple corer, then you can definitely still fill your cupcakes by just cutting a small hole down the middle with a paring knife. I filled these cupcakes with a wonderful thick coconut glaze, I also added some shredded coconut for additional flavor! The frosting, yet again, coconut! Are you noticing a theme here? I like to go all out with my cupcake flavors. I love having the whole cupcake flow together and be a full on experience. And the frosting is topped with, you guessed it, shredded coconut! But c’mon, how pretty are these?! Coconut makes everything look beautiful and elegant. These cupcakes will be perfect for any coconut lover and are beautiful enough to grace the most elegant Easter tables. And bonus: they are fun too! A little food dye and you can the coconut any color you like for the younger crowds. Or add a few jelly beans on top. The options are endless. Hope you all enjoy the cupcake recipe and make sure to stop by House of Yumm to follow along with my home cooking adventures as well! Get Cupcakes & Kale Chips delivered to your Inbox! Every Friday you’ll see all of the Yummy Eats & Tasty Sweets from the week. Sign up HERE. Preheat oven to 350 degrees. Line cupcake tray with cupcake liners. Set aside. In large bowl combine the eggs, coconut milk, oil, and coconut extract. Stir to combine. Add in the white cake mix and stir until completely mixed. Using a 1/4 cup measuring cup scoop the cake batter into the cupcake liners, filling them about 3/4 of the way full. Bake for approximately 16 minutes or until a toothpick inserted into the center comes out clean. Remove from the oven to cool, cool for 5 minutes in the cupcake tray, then remove to continue cooling on a wire rack. In a small bowl combine the powdered sugar, heavy cream, coconut extract, and shredded coconut. Stir until completely combined. Once cupcakes are cooled, cut out the center, I used an apple corer, or you can also use a paring knife, cut a small circle approximately 1/2 an inch in diameter and 1 inch deep. Set aside the piece of cupcake, fill the center hole with filling and place the piece of cupcake back inside to close up the hole. In large mixing bowl add the butter and mix until creamy, add the heavy cream and powdered sugar and mix on low speed until fully combined and frosting is peaking. Add in the coconut extract and mix. 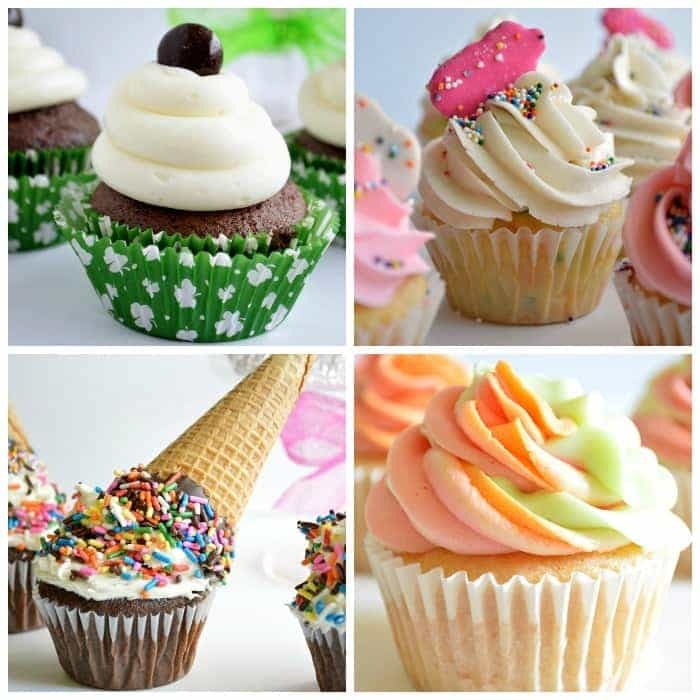 Add frosting to piping bag and pipe onto cupcakes. I used a Wilton 2A tip to add the frosting to the top in a circle shape. Pour the sweetened shredded coconut into a small bowl. 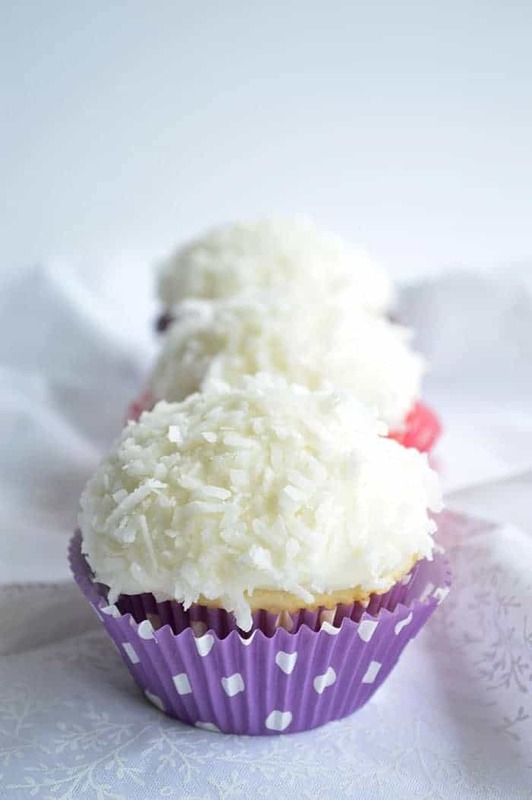 Holding the cupcake upside down, gently press the frosting into the shredded coconut until the top of the cupcake is coated in coconut. Serve immediately and enjoy! Cupcakes can be stored in a closed container at room temperature for approximately 3-4 days. Did you use salted butter in the frosting? Just made the filling and frosting to go in chocolate cupcakes and the frosting is very sweet so it made me wonder. Thank you! This was made using unsalted butter, but ading a pinch of salt couldn’t hurt to balance out the sweetness. Is it unsweetened coconut milk? Also with heavy cream doesn’t filling and frosting require refrigeration? If you are concerned you can definitely store them in the fridge and either enjoy cold or just bring to room temperature before eating them. Made these for my Dads 65th Birthday…they turned out fantastic…so delicious. Thank you. I’m so happy to hear that you enjoyed the cupcakes, Kim. Thank you! Have you ever made these cupcakes the day before you want to eat them? I am making cupcakes for my sister’s wedding, and we are planning to make them the afternoon before the wedding. The recipe looks great! I think that would be fine. What a fun idea! What is the weigh of white cake mix in the cupcake? I made these coconut cupcakes on Thursday and was told by one lady that it was the best cupcake she had ever eaten. This is a great recipe and one I will make again and again! Thank you so much. 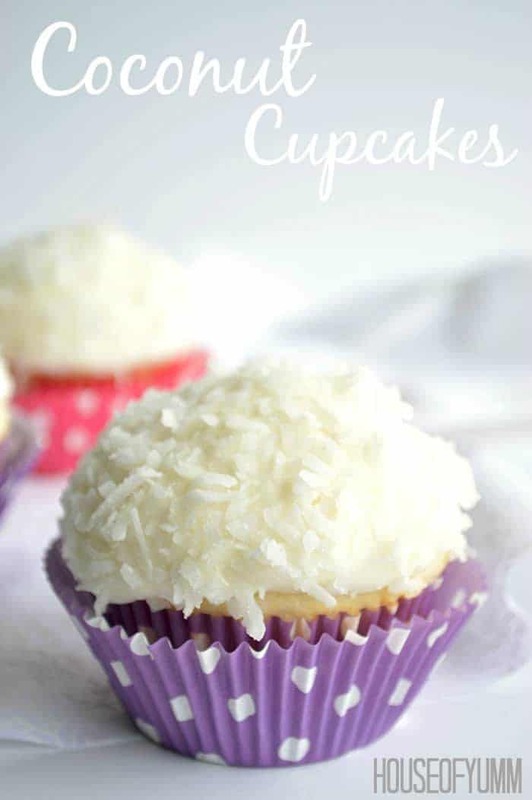 I LOVE LOVE LOVE coconut so I can’t wait to make these cupcakes! 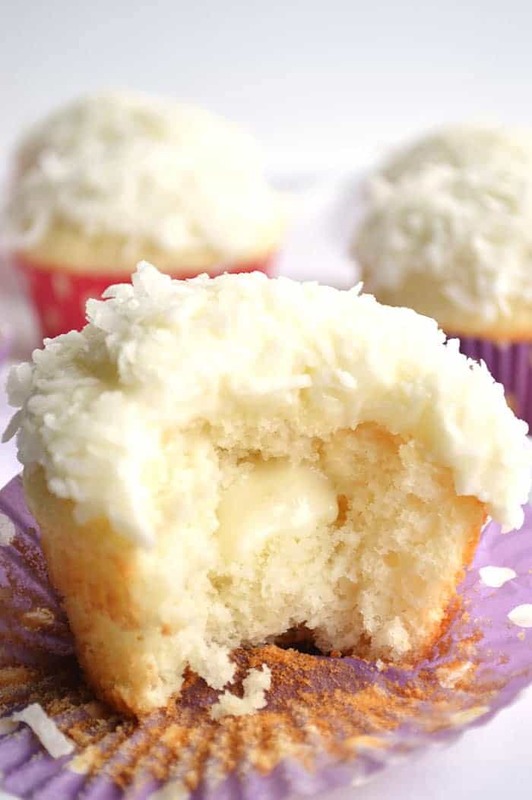 Oh la laaa…these coconut cupcakes look super good, especially the filling. I need to make big batch of these for sure.